On the 9th April 2017, an industrial visit was organized for Entrepreneurship students of 4th semester who were accompanied by three of the faculties of the department. 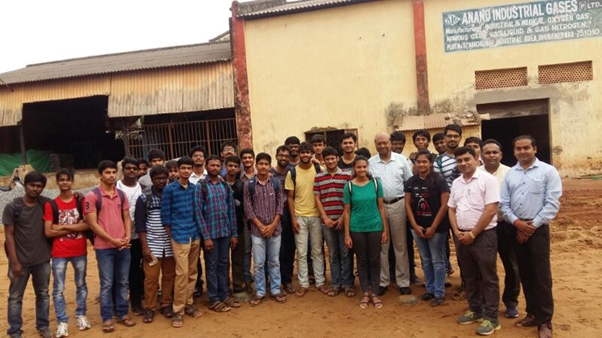 The visit was to the Anand Industrial Gases Ltd, situated in Mancheswar, Bhubaneswar. Anand Industrial Gases Private Limited is a Private incorporated on 04 January 1980. Anand Industrial Gases Private limited is mainly involved with the production of gases such as Nitrogen, Oxygen etc which is used by hospitals and some other companies. Mr. Mahapatra , Director of the company took charge and had taken the group to the plant around noon and briefed up with the introduction about the plant as well as the number of production lines. He also mentioned about every activity happening in the plant like Raw material, filling, manufacturing, purifying and packaging. He also answered the queries of the students regarding marketing and manufacturing. The visit concluded by the afternoon. The industrial visit to Anand Gas plant was an enriching experience for students in getting live exposure of manufacturing which can help them in their internships and further career enhancements.